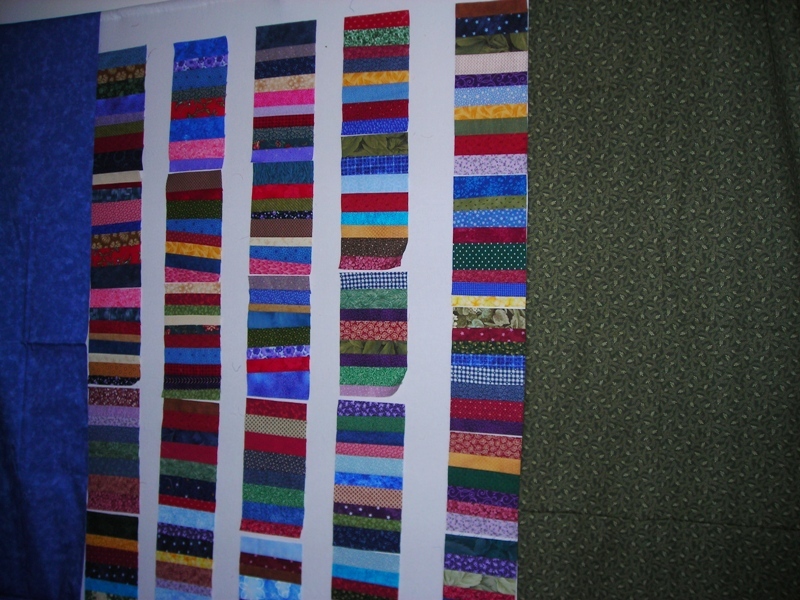 I debated what I’d work on today and the Chinese Coins won out over loading another quilt on the longarm. I put the sections I have up on the design wall and can see a few I need to move around. I had thought I’d use the blue fabric for the border and sashing but I like the green better. Can I get this top done today? I still need to make about 2 rows of coins and I also want to walk downtown this morning or afternoon to grab a bite to eat and visit the bookstore. I agree that the green is better. It’s so much fun to play with bits on the design board. Oh, yes the green wins in my eye, as well. Can’t wait to see it done, Mary! I agree…green it is. I think it makes the blue in the coins pop out more…guess what? The newest QuiltMaker has a Chinese coin pattern in it. We did’nt know we were so hip! They call theirs Good Cents. Cool Chinese Coins, Mary. And I really like the green for borders. I finally got started on the quilting for the antique remake yesterday…quilting again, at last! What is the size of your coin sections?I love it … green.